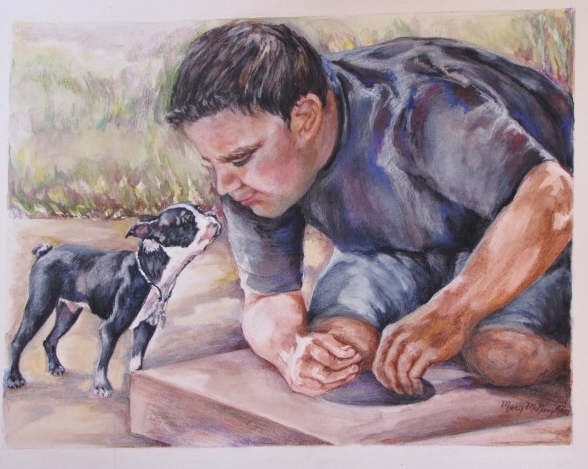 Nearing the final stages of the mixed media drawing of our grandson Joe and his Boston Terrier Frankie. I had originally thought it would be watercolor with colored pencil, however I found pastel provided the drama and abstractions where needed. The pose was a difficult one and I was very unsure of it. However, time and the light play over the subjects led to subtle nuances which added to the story line. Plus I enjoy this tender moment in Joe’s relationship with Frankie. You are currently reading Final Version of the Drawing of Joe and Frankie at Dr. Mary McNaughton and Drawing.